If you’re like most people you probably have a lot of used items that you no longer use and are just laying around the house taking up space. Selling your used items is an excellent way to make money online. A few categories of used items that seem to sell great online include electronics, books, video games, and DVDs. People love buying used and second-hand items online, and most are very easy to ship in the mail. When an item that you have is available for trade-in on their website, it’ll display the amount you can receive for trading-in that item. There will also be a button you can click to add those items to your trade-in list. The amount of money Amazon will give you depends on the item you’re trading-in and the type of condition that item is in. 2. Look over your trade-in list. Once you’ve added the items you wish to sell to Amazon, you’ll be able to view all the items on your trade-in list. You’ll also be able to see the full amount Amazon will credit you for your items. Prices will vary based on an items condition. Amazon always assumes the worst acceptable condition, and once they receive your items, they may upgrade the condition of your items based from their inspection of the items actual condition. So you could end you receiving a higher credit than what you were originally quoted for! 3. Print your free labels and ship your items. Now just print out your shipping labels and get your items ready to ship. Amazon pays for all the shipping costs, so it won’t cost you anything to ship your items. Amazon will supply you with the shipping labels, which you can simply print out from your printer and tape them on your packages. 4. Watch for the confirmation. Amazon will send you an email as soon as they receive and inspect your items. They’ll also let you know if there were any changes in the products condition. You may end up getting more than you expected because your items may have be in better condition than what you were originally quoted for. If there happens to be any items that were redeemed unacceptable, Amazon will ship them back to you free of charge. After your items are received and inspected, you’ll receive an email stating your total trade-in amount value. The total amount you receive will then be credited to your Amazon account, which can be used towards future purchases. 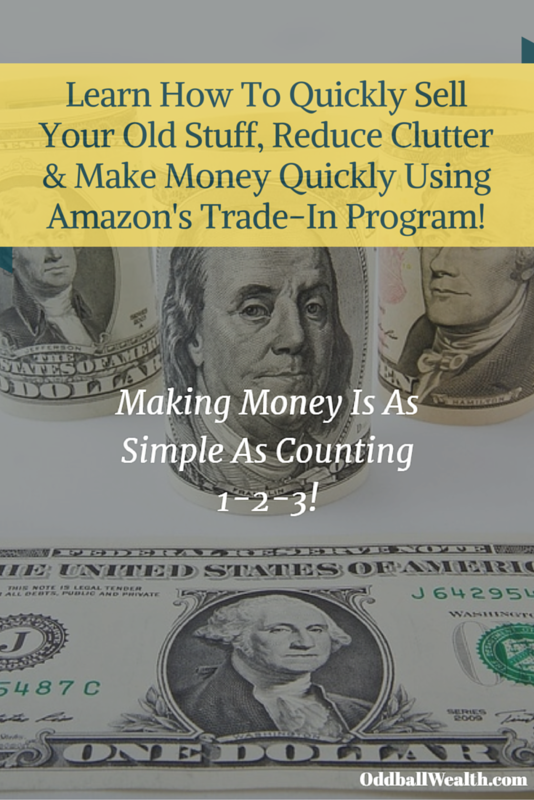 The Amazon Trade-In Program is very convenient and easy to use. I’ve used this program many times, and it served me especially well in college when I used their program to sell my old textbooks at the end of each semester. I would receive more money from the Amazon Trade-In Program than what my University would buy my textbooks back for. Learn more about the Amazon Trade-In Program by clicking here. If you’ve used Amazon’s Trade-In service before feel free to share your thoughts, as I would love to hear about your experience using the program! THANK YOU for sharing this! It comes timely since we are getting ready to move and trying to decide what the heck to do with all the STUFF we seem to have in every crevice of our house. We’ve had some good luck selling all kinds of stuff as we are blogging away our more than $550k in student loans!